The old Allegheny County Jail in downtown Pittsburgh, Pennsylvania is part of a complex (along with the Allegheny County Courthouse) designed by H. H. Richardson. The buildings are considered among the finest examples of the Romanesque Revival style for which Richardson is well known. The jail was built by the Norcross Brothers between 1884 and 1886 (the year of Richardson's death), and the courthouse was finished in 1888 under the supervision of Shepley, Rutan and Coolidge. The two structures are linked across Ross Street by a "Bridge of Sighs" (so called for its similarity to the famous bridge in Venice, Italy). Additions were made 1903–1905 by Frederick J. Osterling. The jail and courthouse were added to the List of City of Pittsburgh historic designations on December 26, 1972. They were added to the List of National Historic Landmarks on May 11, 1976. A new jail opened in spring 1995, and the original jail now houses the Allegheny County Court of Common Pleas Family Division. The old Allegheny County Jail (at left) and its "Bridge of Sighs" spanning Ross Street. Wikimedia Commons has media related to Old Allegheny County Jail. ^ a b "Local Historic Designations". Pittsburgh: Pittsburgh History & Landmarks Foundation. Archived from the original on 21 July 2011. Retrieved 2011-08-11. ^ Historic Landmark Plaques 1968-2009 (PDF). 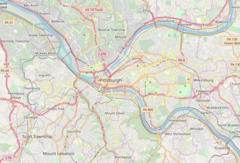 Pittsburgh, PA: Pittsburgh History & Landmarks Foundation. 2010. Archived (PDF) from the original on 21 July 2011. Retrieved 2011-08-12. This page was last edited on 23 February 2019, at 08:48 (UTC).